totally soaked) will tell you otherwise. actually seems, for once, halfway inviting. that adds brightness to otherwise dreary days. Especially when combined with rum and caramel. vanilla, eggs, and the date/rum mixture. 10-12 minutes, or until thickened. to pour some sauce on the cake and save some to serve alongside it. and involved dates and prunes and rum. so had been wanting to use that bundt pan!). caramel took a bit more elbow grease. knew it, the caramel was smooth and creamy again. When there’s a will, there’s a way. Just so you know. with a deep, dark, vaguely adult flavor. ladder more than a few notches. caramel stop you from enjoying something delicious. Manila, nor have I ever had any need for it. teaspoons baking powder + 1/4 teaspoon salt. and honey and it worked fine. Rum-infused caramel, you say? Don't mind if I do! 🙂 That cake looks amazing! ohhhhhhhhhhhhhh the site of the oozing caramel alone is mouthwatering already! i'm going to make some of that to dip some store brought butter cake on it since i don't have baking equipment yet (bookmarking this though and will definitely try it in the future). Hi Mom-Friday! Try making it…we loved it! 🙂 I don't have an extra second to spare for a food business because of my day job! Ha don't be fooled by that so called summer here in europe as I think it might pretty much resemble your monsoon at times. It's been wet and not summery at all. Perfect I would think for such a gorgeous cake! i remember this cake! Need to make it soon!! This cake is filled with mouth-watery goodness. I can't wait to make this. with your description I can almost taste the cake! and the photo is really great as well. stay warm and cozy! the weather is unforgiving. Fantastic-looking cake! Can I have some please? Hi Dhanggit! Oh yes, lovely with coffee! Hi Gio! It really was all that 🙂 So happy I tried this recipe…love Donna Hay!! 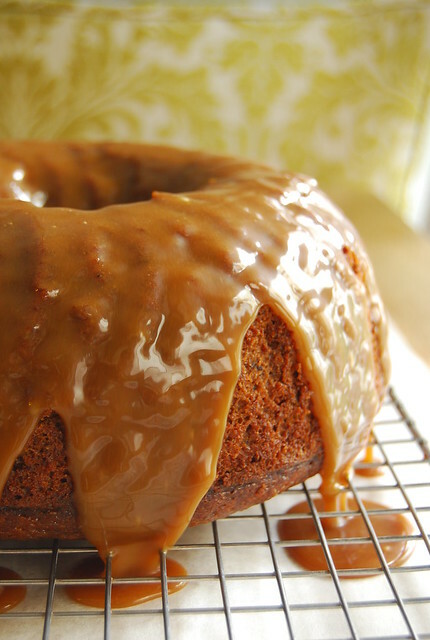 I love your description of how you showed that wayward caramel and Bundt pan who was boss. And speaking of boss…that cake looks to die for. Thanks for all the useful tips. Will keep in mind for when I finally gather the courage to venture into baking. Oh, that glaze works like make up, doesn't it? Your cake looks perfect! I saw this recipe on the mag and cannot wait to make it too, especially now after seeing your beautiful version, Joey! Wow that cake looks divine and I love that caramel sauce! I've had cake stuck to my bundt tin too…maybe dusting with flour will help! Hi Fern! Thanks and no worries! I really loved this cake and think it is definitely worth the mild aggravation of having it stick…I'll try the dusting as well next time! Hi Heidi! The dates give the cake a great flavor and a moist texture…it's lovely really! Hi! Was googling for a recipe for rum cake and stumbled upon this blog! Awesome recipe 🙂 Just wanted to say you might be able to get some of Lyle's golden syrup at union jack tavern in Alabang. Sometimes they have it, sometimes they don't but they stock pretty often. I was able to buy some back in 2010, hope that helps!